For this card, I layered a piece of the Nature’s Poem paper with some Soft Suede Cardstock, adhered them to a Crumb Cake card base, and added a Linen Thread bow. I used the Layering Circles Framelits to die cut a scalloped circle from Vellum Cardstock. Layered on top of that is a small square of Nature’s Poem paper (using the Stitched Shapes Framelits), and a Whisper White scalloped square (using the Layering Squares Framelits). 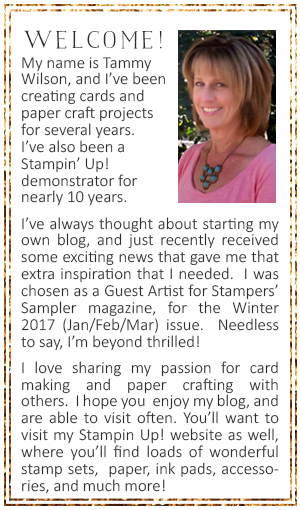 I also popped up both squares with a few Stampin’ Dimensionals. The sentiment (from the P.S. You’re the Best stamp set) was heat-embossed on Basic Black Cardstock, using White Stampin’ Emboss Powder and a Versamark Pad. To add an extra bit of detail, I used a two of the wood elements from the Frames Elements assortment, as well as a couple of Faceted Dots.